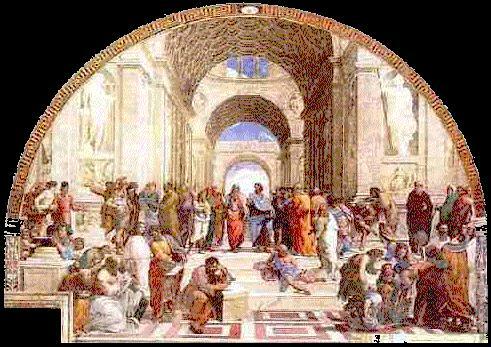 Alfred North Whitehead, Process and Reality, p. 53 [Free Press, 1969]; the painting is the School of Athens (Scuola di Atene) by Raphael, with Plato, pointing up, and Aristotle, gesturing down, in the middle [note]. The Master said, "At fifteen I set my purpose on learning. At thirty, I was established. At forty, I had no doubts. At fifty, I knew the Mandate of Heaven. At sixty, my ear was obedient. and not transgress the square." BILL MURRAY: "What did you study?" 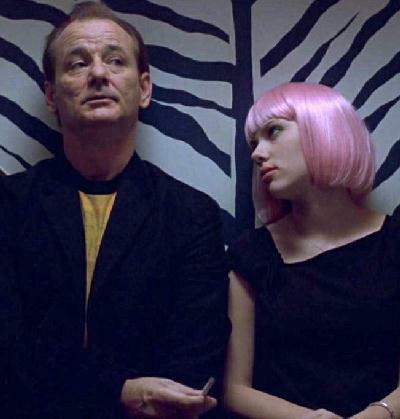 BILL MURRAY: "Yeah, there's a good buck in that racket." SCARLETT JOHANSSON: "Well, so far it's pro bono." Traditionally, these are questions for philosophy, but philosophy is dead. The works that are being peddled about nowadays as the philosophy of National Socialism but have nothing whatever to do with the inner truth and greatness of this movement (namely the encounter between global technology and modern man) -- have all been written by men fishing in the troubled waters of "values" and "totalities." Was heute vollends als Philosophie des Nationalsozialismus herumgeboten wird, aber mit der inneren Wahrheit und Größe dieser Bewegung (nämlich mit der Begegnung der planetarisch bestimmten Technik und des neuzeitlichen Menschen) nicht das Geringste zu tun hat, das macht seine Fischzüge in diesen trüben Gewässern der »Werte« und der »Ganzheiten«. Martin Heidegger, An Introduction to Metaphysics, Translated by Ralph Manheim, Anchor Books, New York, 1959, p.166; Einführung in die Metaphysik, Max Niemeyer Verlag, Tübingen, 1953, 1998, p.152; color and boldface added; the infamous post-War endorsement of Nazism by Heidegger, who has been said by many to be one of the greatest philosophers of the 20th Century. and again Xenophanes and Hecataeus. The Origin of Philosophy: Why the Greeks? Arthur Schopenhauer, On "the Professors of Philosophy"
Kant's "Attack on the Noumenon"
We, on the contrary, now send to the Brahmans English clergymen and evangelical linen-weavers, in order out of sympathy to put them right, and to point out to them that they are created out of nothing, and that they ought to be grateful and pleased about it. But it is just the same as if we fired a bullet at a cliff. In India our religions will never at any time take root; the ancient wisdom of the human race will not be supplanted by the events in Galilee. On the contrary, Indian wisdom flows back to Europe, and will produce a fundamental change in our knowledge and thought. Rafael has Plato pointing up and Aristotle gesturing down to indicate the difference in their metaphysics. For Plato, true existence is in the World of Forms, in relation to which this world (of Becoming) is a kind of shadow or image of the higher reality. Aristotle, on the other hand, regards individual objects in this world as "primary substance," and he dismisses the existence of Plato's Forms -- except, that is, for God, who for Aristotle is pure form, pure actuality ( ) without matter. However, when it comes to ethics and politics, the gestures should be reversed. Plato, like Socrates, believed that to do the good without error, one must know what the good is. Thus, we get the dramatic moment in the Republic where Plato says that philosophers, who have escaped from the Cave and come to understand the higher reality, must be forced to return to this world and rule, so that their wisdom can benefit the state. Aristotle, on the other hand, says that the "good" is simply the goal of various particular activities, without one meaning in Plato's sense. The particular activities of most human affairs involve phrónêsis ( , prudentia), "practical wisdom." This is not sophía ( , sapientia), true wisdom, which for Aristotle involves the theoretical ( ) knowledge of the highest things -- he says that is concerned with , "the primary causes and principles" [Metaphysics 981b29, Loeb, Vol. 1, p.8; see first principles] -- i.e. eternal truths, the gods, the heavens, and God. Thus, for philosophy, Aristotle should be pointing up and would represent a contemplative attitude that was certainly more congenial to religious perspectives in the Middle Ages. Similar caution should be exercised in considering Aristotle's contribution to what we now think of as science. This was gravely hampered by his lack of interest in mathematics. Although Aristotle in general had a more empirical and experimental attitude than Plato, modern science did not come into its own until Plato's Pythagorean confidence in the mathematical nature of the world returned with Kepler, Galileo, and Newton. For instance, Aristotle, relying on a theory of opposites that is now only of historical interest, rejected Plato's attempt to match the Platonic Solids with the elements -- while Plato's expectations are now in fact realized in mineralogy and crystallography, where the Platonic Solids occur naturally. It is arguable that Aristotle's view of mathematics, and his inductive theory of "scientific" method, not only inhibited the development of science during the Middle Ages, but continued to confuse philosophers and scientists at least until Karl Popper. Therefore, care is in order when comparing the meaning of the metaphysics of Plato and Aristotle with its significance for their attitudes towards ethics, politics, and science. Indeed, if the opposite of wisdom ( ) is, not ignorance ( ), but folly ( ), then Socrates and Plato certainly started off with the better insight. The traditional stereotype of the relation between Plato and Aristotle is now reinforced by The Cave and the Light: Plato Versus Aristotle, and the Struggle for the Soul of Western Civilization, by Arthur Herman [Random House, 2013]. We discover, according to Herman, that Plato was detached from reality and thus ultimately fostered the fanaticism of Nazis and Terrorists, while Aristotle was empirical and pragmatic. Plato's thought was retrospective, while Aristotle's was progressive. The whole history of Western civilization has been a tug-of-war between these two perspectives, with Aristotle's approach clearly more benign and salutary. Although Herman was previously responsible for a fine book, How the Scots Invented the Modern World , the cautions above should be enough to explode his thesis about Plato and Aristotle. We can even question the seriousness of Aristotle's empiricism when we recall that he never tested his theory about falling bodies, which was left to John Philoponus and then Galileo to refute. What may be worse than Herman's shallow caricature of the ancient philosophers, however, is a distortion of the history of philosophy by the neglect of the way that Neoplatonism combined Plato and Aristotle into a single powerful, durable, and influential system. The Neoplatonic approach, that there was no real difference between Plato and Aristotle, would certainly be puzzling to Herman; but its explanation would be called for in any comprehensive treatment of the two over the long period that Herman undertakes to cover, including the whole history of philosophy in Mediaeval Judaism and Islâm. Since Neoplatonism was fostered for centuries in Constantinople, and returned for one last blast of influence in the Renaissance, Herman has no excuse not to give it a central role in the history of philosophy. But, to be sure, it complicates the facile dualism upon which Herman's narrative relies. While Schopenhauer was correct about the lack of impact of English Christian evangelism on India, he has failed to recall, or perhaps at the time did not know, that a large part of the population of India, 25% or so, had already converted to Islâm, which in turn drove Buddhism to extinction in the land of its birth. Islâm, as much as Judaism and Protestant Christianity, was lacking the key ingredient to real religion, as far as Schopenhauer was concerned: Monasticism. What was worse, Islâm offered explicit promises of very earthly pleasures for the Saved in Paradise. This earned nothing but contempt from Schopenhauer. Christian evangelism, of course, was soon, after the Great Mutiny of 1857-1858, renounced as any part of official British policy in India.